Supermicro contacted me about reviewing their SC842TQ-665B chassis a few weeks ago and I thought it would be a good departure from the pure storage chassis. Sometimes, a large 4U 20-24 3.5″ bay enclosure is unnecessary. With today’s 3.5″ disk prices, adding a 4TB usable RAID 6 array plus hot spare and a few SSDs for caching in ZFS L2ARC style configurations can be a very viable alternative when massive amounts of raw storage are not needed. The SC842TQ-665B has a mix of hot-swap bays, 5.25″ expansion bays, and solid cooling all in a small, 20.5″ deep, chassis. I detailed the dual Xeon processor build in an earlier dual processor test bed build log piece. I will note, the motherboard was a very tight fit as it is a large board and it is not on Supermicro’s compatibility list for the SC842TQ-665B. It took a bit of careful maneuvering, but everything did fit. I intentionally used quite a few passively cooled cards to see if the case’s airflow was sufficient to cool the cards. Drive expansion is not an ultra-dense 4U configuration, but does provide quite a bit of expandability. 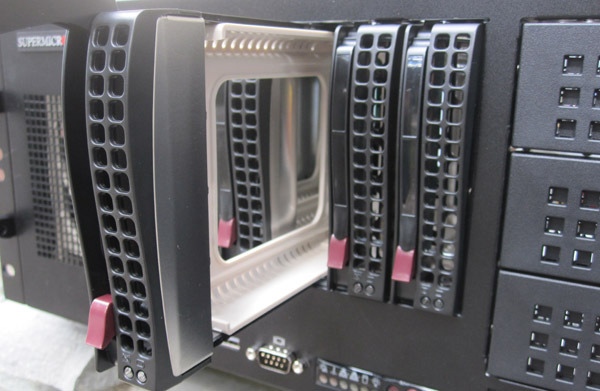 Five hot swap 3.5″ SAS/ SATA drive bays occupy the middle portion of the front bezel. Next to these are three 5.25″ empty bays and at the lower right portion of the front bezel a slim optical drive bay can be found. The left side of the chassis has a 92mm x 38mm PWM fan that is hot swappable. In the lower middle portion there is a slick LED place with things such as dual NIC LEDs and an overheat LED. 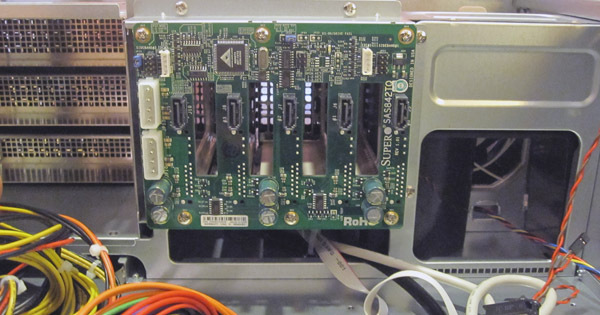 Drive carriers are the side rail types so mounting 2.5″ drives in the 3.5″ hot swap bays will require an adapter. I had no issues installing five drives and sliding them in easily so it seems, at least on the test unit, that the workmanship is good in this area, and on-par with some of the storage centric Supermicro chassis reviewed previously on this site. The 3.5″ hot swap bays support SGPIO (two ports) which allows one to see which drive failed via the LEDs associated with each 3.5″ slot. 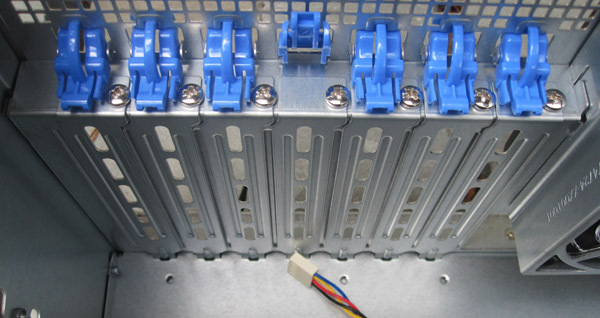 On the flip side, the backplane accepts two 4-pin Molex style connectors and five standard 7-pin SAS/ SATA connectors. Since the Supermicro X8DTH-6F supports SGPIO this was easy to connect. Also pictured above are the three 5.25″ bays which can be used for optical drives and/ or mobile racks on the left side of the picture. The bottom left shows the slim CD/DVD carrier among the power supply cables. On the right side of the above picture one can see the hot swap 92mm fan that has a duct redirecting half of the airflow to the center of the chassis. This helps more evenly distribute air to the center of the chassis since there is no room in such a short chassis for a mid-chassis fan partition. 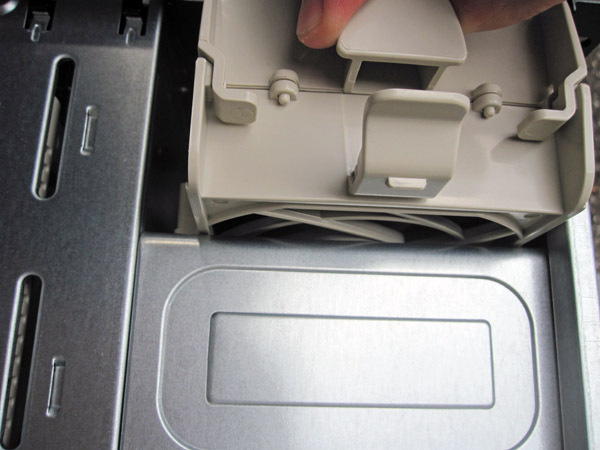 That 92mm fan is easy to remove by simply pushing in a plastic clip and pulling the unit out. Two big points here are that it is very easy to service the fan in the event of failure, and the assembly did not buzz despite being a rotating part that is easily removable. 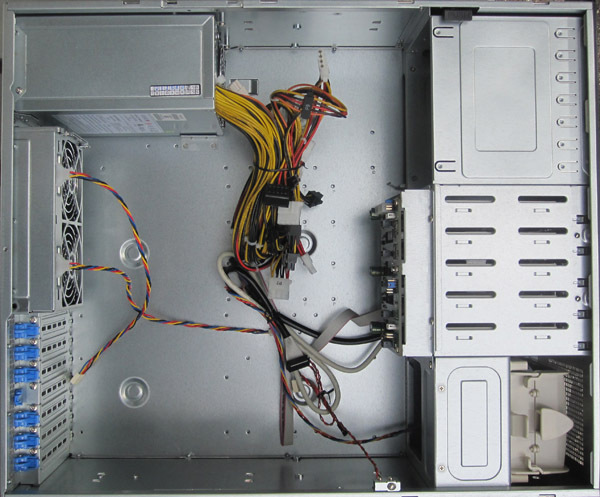 One can see the importance of this fan by looking at the overall interior layout of the chassis. 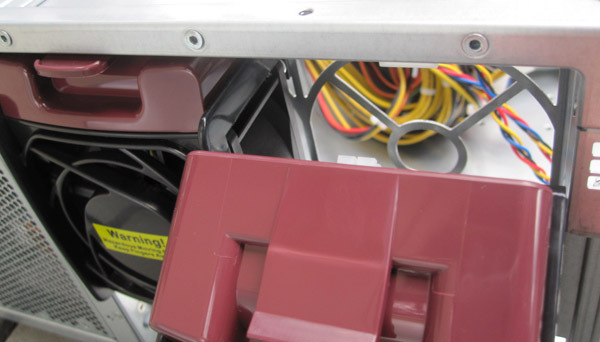 One will notice that the power supply fan pulls air from the front of the chassis exhausting in the rear. The front removable fan mentioned earlier pushes air through all of the expansion slots due to the ducting. This setup worked well as even being stressed, none of the expansion cards overheated during testing. Dual mid-line 80mm x 38mm PWM controlled fans exhaust air from the part of motherboards usually occupied by RAM and either one or two CPUs. As one can see, the rear of the chassis (note the motherboard I/O backplate area is open here) is designed to be one giant exhaust surface. I have had the system under near 100% average CPU utilization on the dual processors and running expansion card tests over the past few weeks. The system has been rock-solid never once throwing an overheat alarm, becoming unstable, or having a RAID controller or 10Gb NIC overheat and perform erratically. For those wondering what the blue plastic bits are above the seven expansion slots, they are locking devices to secure expansion cards. From a noise perspective, the experience with the SC842TQ-665B varied greatly. The X8DTH-6F has ample 4-pin fan connectors so at startup the fans would run at full speed and generate a lot of noise. Once the system got going, the fan speed decreased as did the noise. It is certainly not quiet enough to be a desktop, but could be used in a closet rack in a small business just as easily as it could be installed in a data center. Overall, the Supermicro SC842TQ-665B provides a compact, well designed server chassis which balances expandability, size, noise, and ease of maintenance to yield something that is both user friendly and relatively cost effective. The entire package retails for just over $300 which is very competitive with a 4U barebones rack mount case, power supply, and a 5-in-3 mobile rack. The difference is that the SC842TQ-665B integrates everything fairly well with features like hot-swap fans which make maintenance easy. I really like SuperMicro chassis but this model provides no way to mount drives in their 3 5.25″ bays. No brackets, no rails and no screw holes. Their tech support which is normally wonderful, has no idea how to mount the drives. – Strange!